Belgrade held regular municipal elections on Sunday 4 March. These were the first municipal elections since the mass protests against the Belgrade waterfront project in spring 2016. As such, they were a major test for the conservative Aleksandar Vučić regime since his presidential re-election in 2017. The regime understood the dangers posed by a potential opposition breakthrough, and poured major resources into the municipal election. Serbian President Vučić increasingly distanced himself from the discredited and outgoing mayor, Siniša Mali, and made the election a referendum on himself personally. His party’s list carried his name on it on the electoral ballot. This was risky but turned out to be a good move. The logic was to shift the issue of the election away from concrete issues relating to Belgrade and towards the national debate about the way forward. The Serbian Progressive Party (SNS) thus won 44.9% of the votes in the capital city. This was up over a percentage point on the previous municipal elections in 2014. To some extent, the opposition claim that this vote was not fully free and fair is true. The SNS benefits from significantly more media coverage than the opposition groups. Various irregularities, including intimidation of voters, were documented in several voting booths across the city. The presence of police in the city centre was a message to those who thought it might be necessary to protest against the result that they should not do so. However, this cannot account for the scale of the victory. Vučić is clearly popular in Serbia for a number of reasons. He arrested the country’s most infamous tycoon while deputy prime minister, sending the false message that he was prepared to restore the power of the state over that of private capital, which had run riot for years. In reality, the SNS has clearly benefitted from an apparent, though slight, increase in foreign direct investment over several years, giving it a slight sense of dynamism in an otherwise stagnant country. He also has credentials among nationalist voters as someone who comes from a radical nationalist background in the 1990s. 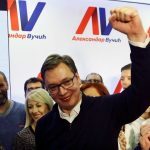 Even Vučić’s effectively pro-Western stance is not widely resented in nationalist circles because he has continued his predecessor’s balancing game between the powers. He often presents his pro-Western stances and conciliatory politics in the region as motivated by Serbian national interest, rather than a result of necessary and desired diktats imposed from abroad. At a time when the European Union is clearly in deep crisis, this makes him look more pragmatic than the opposition, which slavishly follows a pro-Western stance. Indeed, the main opposition group was the “same old“ group that ruled Serbia after Milošević, only this time standing outside the “mother ship”, the Democratic Party, which crashed to a deserved 2.25 percent in the election. This “new” opposition was led by former Democratic Party mayor Dragan Djilas, who won just under 19 percent of the vote, just over 3 percent more than his result in 2014. This was an improvement, but hardly a significant one given the swing required to challenge the current government. Only two other groups crossed the 5 percent barrier. The first was the result of an apolitical campaign by a former water polo player who now runs a local government in Belgrade, Novi Beograd. His list won just over 9 percent. The second was that of the SNS’s partner in the national coalition, the Socialist Party of Ivica Dačić. This group won just over 6 percent, which was a fall of over 5 percent from the last election. As in the last election, only four lists won more than 5 percent of the vote. 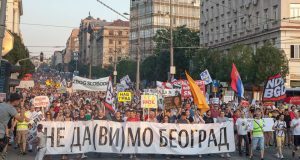 The sense of relative stasis in Belgrade was broken in a minor way, however, by the campaign of the “Don’t Let Belgrade D(r)own” (Ne da(vi)mo Beograd, NDB) list. This was a campaign run largely by the leadership of the anti-waterfront protests which had brought tens of thousands on the streets in 2016. The NDB won 3.44 percent of the vote (just over 28,000 votes), which is a significant step forward for protest politics in Serbia. Its campaign rested largely on the symbolic capital gained from being the group that led protests against what was seen as a major misuse of governmental power. The death of a security guard following an illegal demolition of a building to make way for the waterfront project has still not been solved, and stands as testament to a corrupt government in league with international big business. Yet the campaign also made soft left criticisms of the entire privatisation project in Serbia. This leaning to the left was further symbolically underlined by links with Barcelona’s radical left, and its methods, like use of direct democracy to write a programme for the municipal city elections. In so far as this captured the spirit of struggle from below that had characterised the protests of 2016, it also drew in left wing support. Indeed, various small left groups like the Social Democratic Union and the revolutionary socialist group, Marks21, participated in the writing of a left programme, which raised popular issues like workers’ rights, social housing and women’s liberation. They also intervened in the campaign in an attempt to emphasise working class issues. The Don’t Let Belgrade D(r)own movement brought together a broad group of left wing and social movement activists. In the public imagination, however, the campaign overall probably did not appear to be associated with the programme as much as it was with the symbolic struggle for a different, kinder and more democratic politics. That does not take away from the real success of a significant result produced by a loose coalition of small activist and socialist groups whose cooperation only deepened in the months before the election, around such issues as defence of families from eviction from former social housing. Nevertheless, a regional analysis of the vote suggests that no major breakthrough outside the city centre was achieved by the NDB and its left allies. The NDB did better than its 3.44 percent vote in the inner city centre (Vračar 7.17%, Savski Venac 6.56%, Stari Grad 8.05%) and areas immediately adjacent (Voždovac 3.74%, Zvezdara 4.53%, Novi Beograd 4.15%, Palilula 3.98%). It did respectably in working class areas like Rakovica (3.08%), Čukarica (3.16%) and Zemun (2.63%). But it did badly further out (Barajevo 0.90%, Grocka 0.95%, Lazarevac 0.75%, Mladenovac 1.18%, Obrenovac 1.12%, Sopot 0.56%, Surčin 0.20%). While imperfect as an indicator of class vote, this regional breakdown of the vote does suggest that the NDB did not make major inroads in the working class areas. At the same time, it would be premature to suggest that the vote was exclusively middle class. The inner city centre did contribute 5,576 of the total 28,017 votes, around a fifth. It is therefore plausible to presume most of these votes came from white collar workers or middle class professions, or students. And these groups are likely to have been disproportionately represented in the NDB vote. But this is also indicative of the fact that layers of the middle class and white collar working class are breaking with the liberal parties, partly because of the latter’s failure to confront the regime in a convincing way, and partly because the economic crisis is beginning to bite and radicalise even these groups. Moreover, the areas immediately adjacent to the city centre, in which the NDB did well, contributed 14,295 thousand of its votes, more than half of the total votes. These areas are densely populated areas with a significant working class population. It is therefore likely that workers, unemployed and poorer sectors of society did vote in some numbers for the NDB, and it is very likely that younger voters were over-represented among these voters. Though this claim would need further investigation, it was anecdotally visible during the 2016 protests, which did see large numbers of young people on them. The further we look out of the city centre, however, and the fewer votes we see going to the NDB, suggesting the more remote and poorer, though not more populous, areas, did not see their champions in the NDB. By contrast, an unholy alliance of right wing populists in alliance with anti-establishment neoliberals, which won 3,89 percent and beat the NDB to fifth place, garnered fewer votes in the affluent city centre and more votes in the more remote and poorer areas. What the class basis of that vote was remains to be investigated, but the NDB should take note of this dynamic if it wishes to block the rise of a false opposition that does nothing to challenge neoliberalism. In this context, it is worth noting that the ruling party won all but two of the electoral districts, making it appear politically hegemonic. But its basis of support is narrower than first appearances suggest. The deeper truth is that less than 52 percent of the electorate voted, which is in line with previous elections – only slightly up. That was surprisingly even across the city. This suggests that the ruling group is not unassailably hegemonic, but also that none of the opposition groups did enough to galvanise popular opposition to the regime. Defeat for EU and NATO expansion: the fa .. The key for the NDB going forward is to study how it can improve its vote in the working class areas of the capital city, and that will probably not mean taking votes off other opposition groups in the first instance, but providing a hopeful programme that will not just inspire voters to turn out but also, and more importantly, begin to fight back in periods between elections. That programme at the very least must include the social redistribution of wealth and power in the interests of the working majority. But it also has to include building roots in the popular areas. This can be done by understanding what local issues exist from a class perspective. Organising consultations, putting on public meetings, drawing in working class organisations and building mass actions to fight against the effects of austerity and privatisation, and raising the prospect that extra-parliamentary solidary action that can cut across the city and win victories for ordinary people, is the way forward. Supporting major working class fights which are on the horizon after the great FIAT strike of 2017 would be another route to building wider solidarities. This should be the socialist case put to the NDB and its supporters. That would be the way to start building a real alternative that can offer Serbia a new and better way for the future. The election result of the NDB in the municipal elections was not a victory but it was a step forward. It can be built on and lessons can be learned not just for Belgrade but for movements across Serbia. Let us hope that the spirit of comradeship and struggle built in the last months will soon move to greater heights. Vladimir Unkovski-Korica is a member of Marks21 in Serbia. 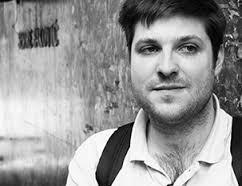 He is a historian and researcher who is currently Lecturer in Central and East European Studies at the University of Glasgow. His first book, The Economic Struggle for Power in Tito’s Yugoslavia: From World War II to Non-Alignment is out now through I.B. Tauris.